Local restaurant owner and BBQ aficionado, Mike Brock and his Naked Pig BBQ team, finished in second place in the ribs category of this weekend’s Flames on the Flint BBQ Festival. The Flames on the Flint BBQ Festival is part of the annual Rivertown Days Festival at the Earl May Boat Basin in Bainbridge. Contestants drive in from all over the United States, from as far away as Minnesota and Oklahoma, for a chance to win the grand prize of $20,000. Mike Brock, of Betty’s Cafeteria, drove across town and took second place. The contestants include nationally known BBQ celebrities and accomplished BBQ competitors and the competition is judged and sanctioned by the Kansas City Bar-be-que Society. 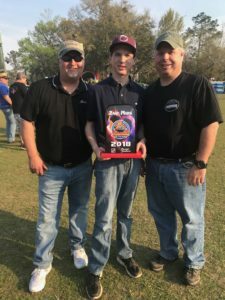 This is the second year in a row that Mike’s ribs have placed in the contest. Last year, Naked Pig BBQ took home third place.